Welcome to the website for Ali's Balti in Corby. We invite you to order here, directly from us and not through Just Eat, for the easiest and quickest online ordering experience. When you order from us at Ali's Balti in Corby directly, instead of Just Eat Corby your loyalty counts. We reward you for ordering through our website with our loyalty points system and allow you to easily repeat your last order - more than what Just Eat has to offer. Unlike Just Eat your order is sent straight to Ali's Balti in Corby, instead of through Just Eat. This is becuase our website is just about Ali's Balti in Corby, we want to build a relationship with you! 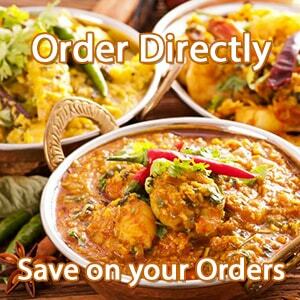 Here at Ali's Balti in Corby we hope you find our online ordering menu much easier to read than those found on other sites. Click here to visit our menu and make an order now. Ali's Balti in Corby has some great five-star reviews that proclaim; ‘Best Indian food in town.’, ‘Always a great meal’ and much more!. Going to the website and joining their Gold Club means you get access to discounts and special offers that can be used online. Ali's Balti in Corby'sd proprietor and chef, Mofozzul Ali, has built his Indian Restaurant's reputation by serving the highest standards of authentic Indian cuisine. The relaxed, friendly atmosphere of our restaurant together with excellent service is something we take great pride in. Ali's Balti serves fresh, scrumptious Indian curry and best of all, it is open now! Using their website www.alisbalticorby.co.uk, you can have delicious food delivered to your door.